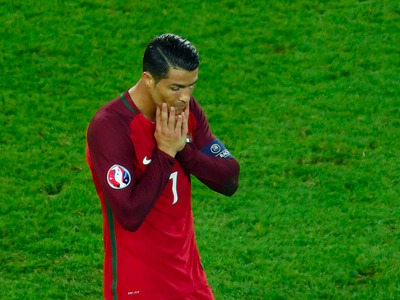 Mike Hewitt / Getty ImagesPortugal’s Cristiano Ronaldo has had a tough start to Euro 2016. Cristiano Ronaldo has been having a bad Euro 2016. Despite making a record 128 appearances for Portugal, he has yet to score in its two games so far in the competition, and even missed a penalty against Austria on Saturday. He has also endured criticism for accusing Iceland of having a “small mentality” following Portugal’s draw with the team in its opening game. But his frustration appeared to really come to come to a head this morning when a CMTV reporter approached the Portugal side walking from its hotel in Lyons. Portugal is currently joint second with Iceland in Group F. If Portugal loses to Hungary this evening and Iceland gets at least a point from Austria, Portugal will be out of Euro 2016.